On the history of anarchism in Turkey and establishing alternatives to the current system through self-organisation, mutual aid and co-operatives. DAF members. Image credit: Crimethinc website. In May this year, Corporate Watch researchers travelled to Turkey and Kurdistan to investigate the companies supplying military equipment to the Turkish police and army. We talked to a range of different movements and campaigns. Below is our interview with three members of the anarchist group Devrimci Anarşist Faaliyet (DAF, or Revolutionary Anarchist Action) in Istanbul in May 2015. DAF are involved in solidarity with the Kurdish struggle, the Rojava revolution and against ISIS' attack on Kobane, and have taken action against Turkish state repression and corporate abuse. They are attempting to establish alternatives to the current system through self-organisation, mutual aid and co-operatives. The interview was carried out in the run-up to the Turkish elections, and touches on the election campaign by the HDP, the pro-Kurdish People's Democratic Party. Soon after the interview took place, the HDP passed the threshold of ten percent of the total vote needed to enter the Turkish parliament. The DAF members—who all preferred to remain anonymous—began the interview by talking about the history of anarchism in the region. DAF: We want to underline the relationship between the freedom struggle at the end of Ottoman times and the freedom struggles of Kurdistan. In Ottoman times, anarchists organised workers' struggle in the main cities: Saloniki, Izmir, Istanbul and Cairo. For example the Italian anarchist, Errico Malatesta was involved in organising industrial workers in Cairo. The freedom struggles of Armenia, Bulgaria and Greece had connections with anarchist groups. Alexander Atabekian, an important person in the Armenian freedom struggle, was an anarchist, translating leaflets into Armenian and distributing them. He was a friend of [the Russian anarchist, Peter] Kropotkin and distributed Kropotkin’s anarchist leaflets. There had been many articles on anarchism in the newspapers. For example, one of the three editors of the İştirak newspaper was an anarchist. The paper published [Russian anarchist, Mikhail] Bakunin’s essays as well as articles on anarcho-syndicalism. Corporate Watch: What happened to anarchists after the Ottoman period? DAF: Towards the end of the Ottoman Empire, at the end of the 19th century, Sultan Abdul Hamid II repressed the actions of anarchists in Turkey. He knew what anarchists were and took a special interest in them. He killed or deported anarchists and set up a special intelligence agency for this purpose. Anarchists responded by carrying out attacks on the Yildiz Sarayi palace and with explosions at the Ottoman bank in Saloniki. The government of the Ottoman Empire didn’t end with the Turkish republic. The fez has gone but the system is still the same. At the beginning of the Kemalist Turkish state in 1922, many anarchists and other radicals were forced to emigrate or were killed. The CHP, Mustafa Kemal's party, didn’t allow any opposition and there were massacres of Kurds. From 1923 to 1980 there was not a big anarchist movement in Turkey due to the popularity of the socialist movements and state repression. The wave of revolutions from the 1960s to the '80s affected these lands too. These were the active years of the social movements. During this period, there were revolutionary anti-imperialist movements caused by the Vietnam war, youth organisations, occupations of universities and increasing struggle of workers. These movements were Marxist-Leninist or Maoist, there were no anarchist movements. In 1970 there was a long workers' struggle. Millions of workers walked over a hundred kilometres from Kocaeli to Istanbul. Factories were closed and all the workers were on the streets. CW: Was there any awareness of anarchism in Turkey at all at this time? DAF: During these years many books were translated into Turkish from European radicalism but only five books about anarchism were translated, three of which were talking about anarchism in order to criticise it. The first anarchist magazine was published in 1989. After this many magazines were published focusing on anarchism from different perspectives; for example, post structuralism, ecology, etc. The common theme was that they were written for a small intellectual audience. The language of these magazines was too far away from the people. Most of those involved were connected with the universities or academia. Or they were ex-socialists affected by the fall of the Soviet Union, which was a big disappointment for many socialists. That’s why they began to call themselves anarchists, but we don’t think that this is a good way to approach anarchism, as a critique of socialism. Between 2000 and 2005, people came together to talk about anarchism in Istanbul and began to ask: “how can we fight?” At this time we guess that there were 50-100 anarchists in Turkey and outside. CW: Can you explain how DAF organises now? 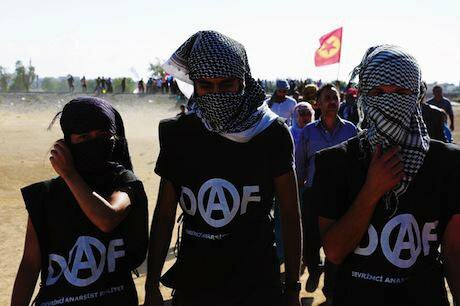 DAF: Now we get 500 anarchists turning up for May day in Istanbul. We are in touch with anarchists in Antalya, Eskişehir, Amed, Ankara and İzmir. Meydan, DAF's newspaper, goes to between 15 and 20 cities. We have a newspaper bureau in Amed, distributing newspapers all over Kurdistan. It is in Turkish but maybe one day, if we can afford it, we will publish it in Kurdish. We send Meydan to prisons too. We have a comrade in İzmir in prison and we send copies to over 15 prisoners. A few months ago there was a ban on radical publications in prisons. We participated in demos outside prisons and we managed to create pressure about this and now newspapers are allowed to go into prisons again. The main issue for DAF is to organise anarchism within society. We try to socialise anarchism with struggle on the streets. This is what we give importance to. For nearly nine years we have been doing this. We want to legitimise anarchism by linking it to struggles against companies and for ecology. On an ideological level we have a holistic perspective. We don’t have a hierarchical perspective on struggles. We think workers' struggle is important but not more important than the Kurdish struggle or women’s struggles or ecological struggles. Capitalism tries to divide these struggles. If the enemy is attacking us in a holistic way we have to approach it in a holistic way. Anarchy has a bad meaning for most people in society. It has a link with terrorism and bombs. We want to legitimise anarchism by linking it to making arguments for struggles against companies and for ecology. Sometimes we try to focus on the links between the state, companies and ecological damage, like Corporate Watch does. We like to present anarchy as an organised struggle. We have shown people on the streets the organised approach to anarchism. From 1989 to 2000 anarchism was about image: about wearing black, piercings and Mohicans. This is what people saw. After 2000, people started to see anarchists who were part of women’s struggles and workers' struggles. We are not taking anarchism from Europe as an imitation. Other anarchists have approached anarchism as an imitation of US or European anarchism or as an underground culture. If we want to make anarchism a social movement, it must change. DAF’s collectives are Anarchist Youth, Anarchist Women, 26A cafe, Patika ecological collective and high school anarchist action (LAF). These self-organisations work together but have their own decision-making processes. Anarchist Youth makes connections between young workers and university students and their struggles. Anarchist Women focuses on patriarchy and violence to women. For example, a woman was murdered by a man and set on fire last February. On 25 November there were big protests against violence against women. LAF criticises education and schooling in itself and tries to socialise this way of thinking in high schools. LAF also looks at ecological and feminist issues, including when young women are murdered by their husbands. PATIKA ecological collective protests against hydro electric dams in the Black Sea region or Hasankey. Sometimes there is fighting to prevent these plants from being built. 26A Café is a self-organisation focusing on anti-capitalist economy. Cafes were opened in 2009 in Taksim and 2011 in Kadıköy, both in Istanbul. The cafes are run by volunteers. They are aimed at creating an economic model in the place where oppressed people are living. It’s important to show people concrete examples of an anarchist economy, without bosses or capitalist aims. We talk to people about why we don’t sell the big capitalist brands like Coca Cola. Of course the products we sell have a relation to capitalism but things like Coke are symbols of capitalism. We want to progress away from not-consuming and move towards alternative economies and ways of producing. Another self-organisation, PAY-DA—'Sharing and solidarity'—has a building in Kadıköy, which is used for meetings and producing the Meydan newspaper. PAY-DA gives meals to people three times a day. It’s open to anarchists and comrades. The aim of PAY-DA is to become a cooperative, open to everybody. We try to create a bond that also involves the producers in the villages. We aim to have links with these producers and show them another economic model. We try to evolve these economic relations away from money relations. The producers are suffering from the capitalist economy. We are in the first steps of this cooperative and we are looking for producers to work with. All of these projects are related to DAF's ideology. This model has a connection with Malatesta’s binary model of organisation. These are anarchist organisations but sometimes people who aren't anarchists join these struggles because they know ecological or women's struggles, and then at the end they will learn about anarchism. It’s an evolving process. As DAF we are trying to organise our lives. This is the only way that we can touch the people who are oppressed by capitalism. There is also the Conscientious Objectors' Association, which is organised with other groups, not just anarchists. Our involvement in this has a relation with our perspective on Kurdistan. We organise anti-militarist action in Turkey outside of military bases on 15 May, conscientious objector's day. In Turkey the military is related to state culture. If you don’t do your military duty, you won’t find a job and it's difficult to find someone to marry because they ask if you’ve been to the army. If you have been to the army, you’re a 'man'. People see the state as the 'Fatherland'. On your CV they ask whether you did military service. 'Every Turk is born a soldier' is a popular slogan in Turkey. CW: Is Kemalism, the ideology associated with Mustafa Kemal, as strong a force as it used to be? DAF: Kemalism is still a force in schools but the AKP has changed this somewhat. The AKP has a new approach to nationalism focused on the Ottoman Empire. It emphasises Turkey's 'Ottoman roots'. But Erdoğan still says that we are 'one nation, one state, one flag and one religion.' There is still talk about Mustafa Kemal but not as much as before. Now you cannot criticise Erdoğan or Ataturk (the name used for Kemal by Turkish nationalists). It’s the law not to criticise Ataturk and the unwritten rule not to criticise Erdoğan. The media follows these rules. People can create federations without nations, states and empires. CW: Can you talk about your perspective on the Kurdish freedom struggle? DAF: The Kurdish freedom struggles didn’t start with Rojava. Kurdish people have had struggles for hundreds of years against the Ottoman Empire and the Turkish state. Since the start of DAF we have seen Kurdistan as important for propaganda and education. Our perspective relates to people’s freedom struggles; the idea that people can create federations without nations, states and empires. The Turkish state says the issue is a Kurdish problem, but for us it is not a Kurdish problem, it’s an issue of Turkish policies of assimilation. We can see this from the last Roboski massacre (of 34 Kurdish cross-border traders by Turkish F16s on 28 December 2011) during the 'peace process'. We can see this in the denial of Kurdish identity or the repeated massacres. The AKP say they have opened Kurdish TV channels, allowed Kurdish language and that we are all brothers and sisters, but on the other hand the Roboski massacre occurred during their government. In 2006 there was government pressure on Erdoğan at a high level. Erdoğan said that women and children who go against Turkish policies would be punished. Over thirty children were murdered by the police and army. The words change but the political agenda continues, just under a new government. We do not call ourselves Turkish. We come from many ethnic origins and Kurdish is one of them. Our involvement in conscientious objection is part of this perspective. We want to talk to people to prevent people from going to the army to kill their brothers and sisters. After the 2000s there has been an ideological change in the Kurdish freedom struggle. The Kurdish organisations no longer call themselves Marxist-Leninist and Öcalan has written a lot about democratic confederalism. This is important, but our relation to Kurdish people is on the streets. CW: Can you talk about DAF's work in solidarity with people in Rojava? DAF: In July 2012 at the start of the Rojava revolution, people began saying that it was a stateless movement. We have been in solidarity from the first day of the revolution. Three cantons have declared their revolution in a stateless way. We try to observe and get more information. This is not an anarchist revolution but it is a social revolution declared by the people themselves. Rojava is a third front for Syria against Assad, ISIS and other Islamic groups. But these are not the only groups that the revolution is faced with. The Turkish republic is giving support to ISIS from its borders. The national intelligence agency of the Turkish republic appears to be giving weapons to ISIS and other Islamic groups. Kurdish people declared the revolution under these circumstances. After the ISIS attack on Kobane began in 2014 we went to Suruç. We waited at the border as Turkish forces were attacking people crossing. When people wanted to cross the border to or from Kobane they were shot. We stayed there to provide protection. In October, people gathered near Suruç, and broke through the border. Turkish tanks shot gas over the border at them. From 6 to 8 October there were Kobane solidarity demonstrations across Turkey. Kader Ortakya, a Turkish socialist supporter of Kobane, was shot dead trying to cross the border. We helped people. Some people crossed the border from Kobane and had no shelter. We prepared tents, food and clothes for them. Sometimes soldiers came to the villages with tear gas and water cannons and we had to move. Some people came through the border searching for their families and we helped them. Other people came, wanting to cross the border and fight and we helped them. We wore clothing that said we were from DAF on it. The YPG and YPJ ['People's Protection Units' of Rojava, the YPJ is a women's militia] pushed ISIS back day by day. Mıştenur hill was very important for Kobane. After the hill was taken by the YPG and YPJ some people wanted to return to Kobane. When they went back their houses had been destroyed by ISIS, or had mines in them and some people have been killed by the mines. The mines need to be cleared, but by who and how? People need new houses and help. We have had conferences and talked about how to help Kobane. There was a conference two weeks ago in Amed. CW: What is your position on the elections? DAF: We do not believe in parliamentary democracy. We believe in direct democracy. We do not support the HDP in the election, but we have links in solidarity with them on the streets. Emma Goldman said that if elections changed anything they would be illegal. There are good people in the HDP who say good things, but we think that the government can’t be good because the election system isn’t equal. In Rojava they do not call it an anarchist revolution, but there is no government, no state and no hierarchy, so we believe in it and have solidarity with it. CW: Can you tell us about the bombing in Suruç? Over 30 young people who wanted to take part in the reconstruction of Kobane were killed by an ISIS attack. This attack was clearly organised by the Turkish state. They did not even do anything to stop it although they had information of the attack one month before. Moreover, after the explosion the Turkish state attacked Rojava and moved against political organisations in Turkey. Now there are many operations against and political pressure on anarchists, socialists and Kurdish organisations. The state is using the explosion as a reason for political repression on both the domestic and international levels. We have lost our 35 comrades, friends who struggled for the Rojava revolution against the state's repression, denial and politics of massacre. There are people who are killed by state, ISIS and other powers. But our resistance won't stop, our struggle will continue, as always in history. Originally published by Corporate Watch on 27 August 2015.